To me, this is the taste of Italy. 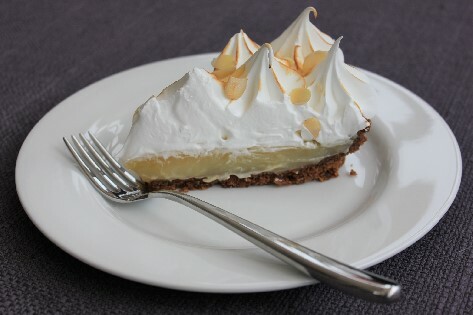 The zesty lemon set against a bittersweet almondy base, laden with butter, sweet meringue, and a shot of Limoncello to finish sounds like the perfect Italian meal and is just what you can expect from this delicious treat. Blitz the biscuits thoroughly in a food processor. You will need a very fine crumb to line the pie dish. The digestive biscuits will add stability to your biscuit base. Pour the melted butter into the processor and mix until completely combined. Press the damp, sandy rubble into the bottom and up the sides of a pie dish. Make sure that the biscuits are pressed firmly into all of the edges and base. Bake in a pre-heated oven for 25-30 minutes and prepare the filling whilst baking. Zest your lemons into a large bowl and squeeze in all of the juice from each one. Set aside. Combine cornflour and sugar in a saucepan, adding the water and stirring into a smooth paste. Bring to the boil over a steady medium heat, stirring constantly. You are looking for the mixture to turn thick and translucent. As soon as this change happens, turn off the heat and continue stirring until the mixture has cooled a little. Beat the egg yolks into the slightly cooled mixture and pass through a sieve into the bowl containing your lemon zest and juice. Mix to combine. Add limoncello to your lemon mixture and taste to check that you are happy with the levels of lemon, sugar, and alcohol. Once happy, pour the lemon centre mixture onto your still warm biscuit base until the filling reaches just below the top of the pie dish. Bake for 25-30 minutes, until set on top when touched lightly with a finger with a little wobble remaining. You may find that the filling has bubbled up around the edges of the pie dish but this will settle as it cools. 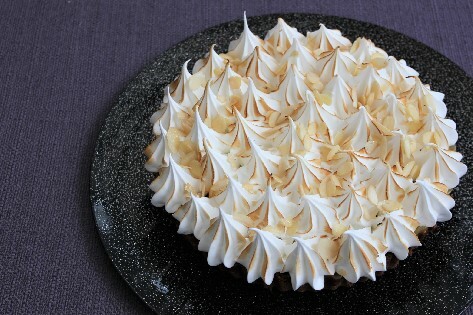 Allow to cool completely before topping with Italian Meringue – this will take at least 2 hours at room temperature and this can be done the day before for convenience. Click here for the full method to make your Italian Meringue topping. 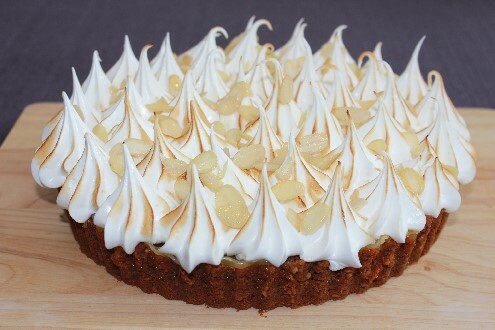 I created the piped effect on my pie with a large open star piping nozzle and sprinkled with flaked almonds to finish.